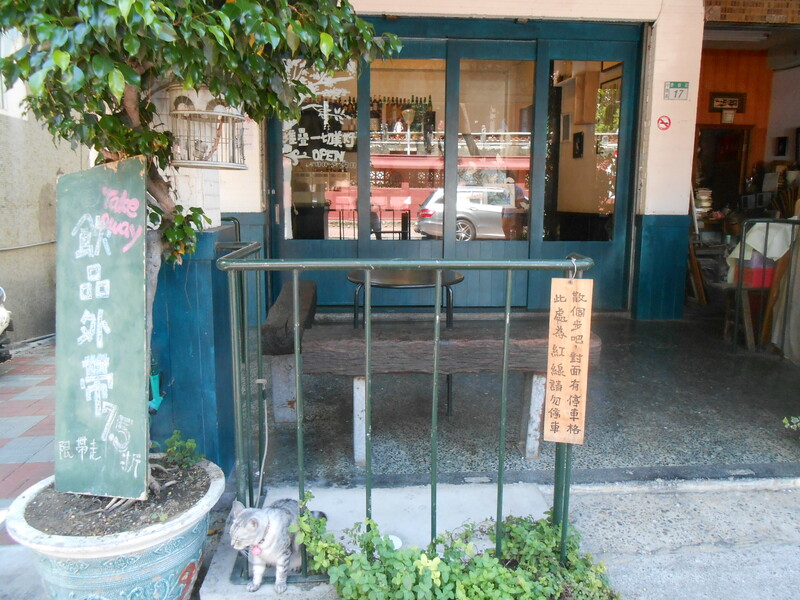 This Tainan cafe was in the second cat cafe book. 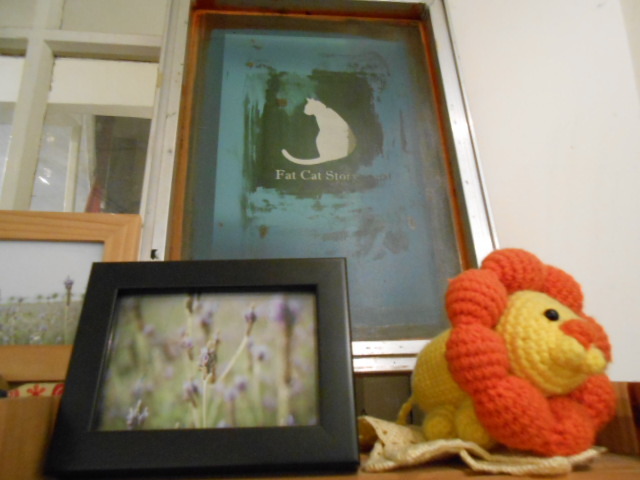 It has two cats but isn’t exactly cat-themed. 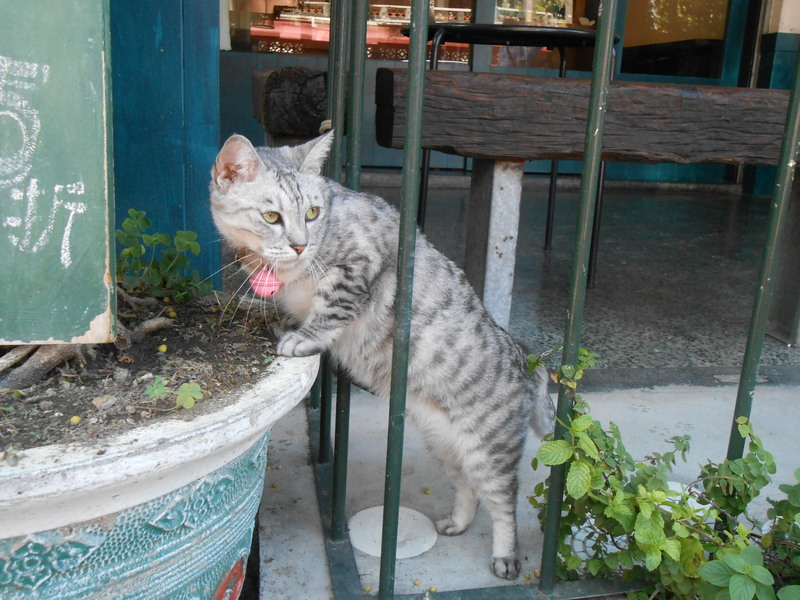 On the first floor, they sell jewelry (not cat-related). Customers order and pay there and then go eat on the second floor. 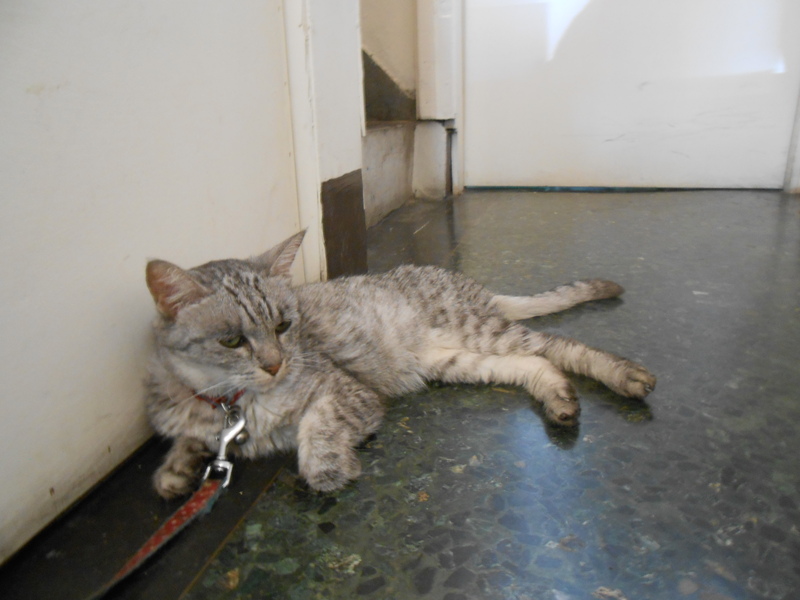 The cats were on the first floor. They were friendly and happy to be petted. 我看到這間太南咖啡館在”貓日和咖啡2″. 他們有兩隻貓, 但是裝飾沒有貓主題. 一樓賣珠寶(不是關於貓的). 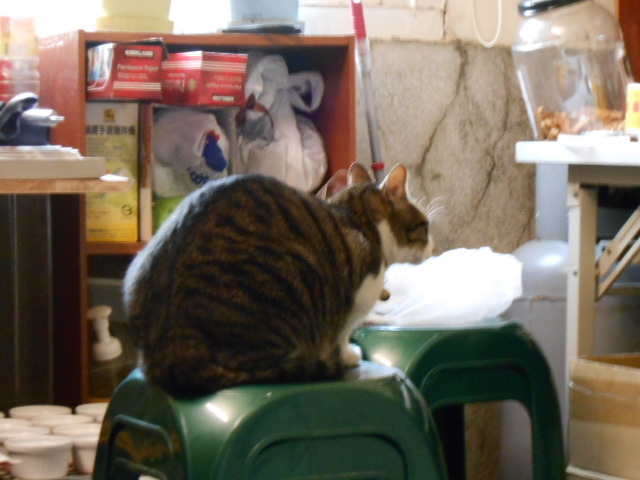 在一樓, 人點餐, 坐在二樓. 貓在一樓. 他們很可愛, 喜歡人摸他們. 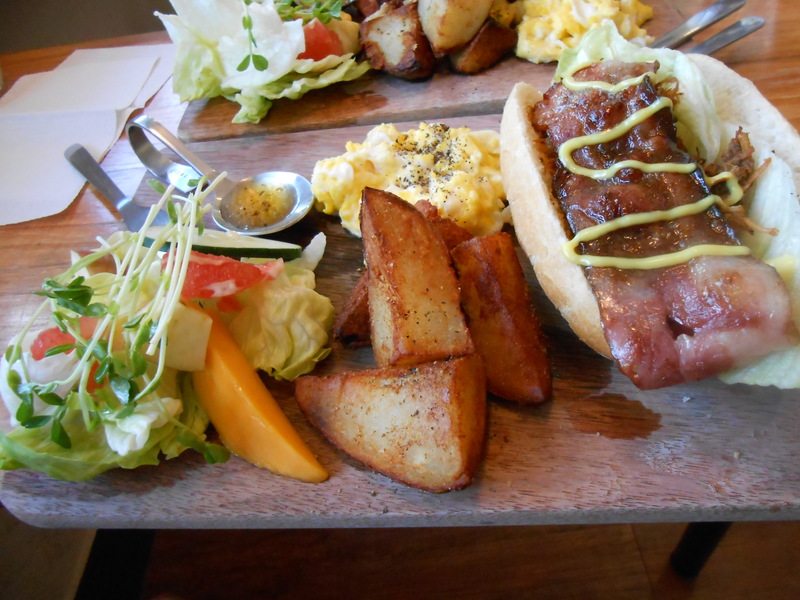 This cafe’s specialty is brunch and they have several delicious choices for NT$230-250. 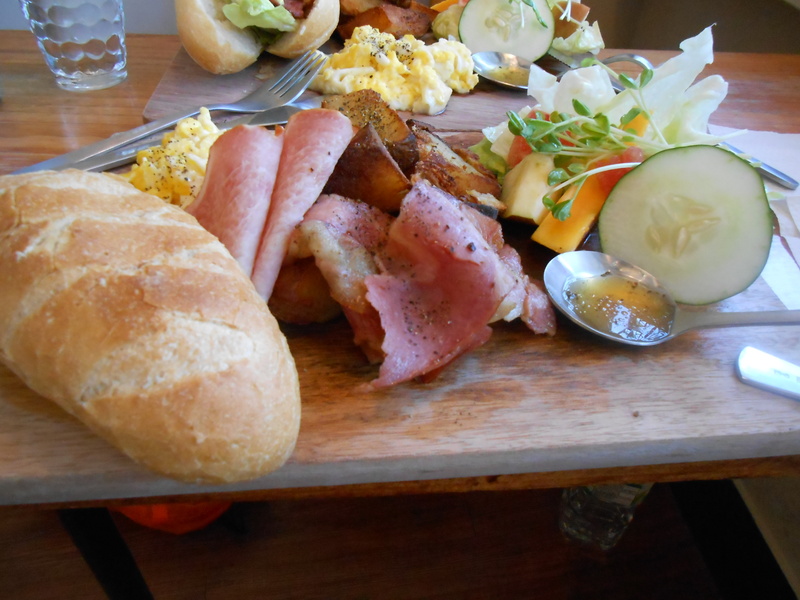 All the meals were presented on cutting boards. The potato wedges were especially good. 他們的招牌是早午餐 (NT$230-250), 都非常好吃, 我很喜歡他們的馬鈴薯. The cafe is right across from Fort Provintia and there’s a good view of it from the window. 咖啡館對面是赤崁樓. 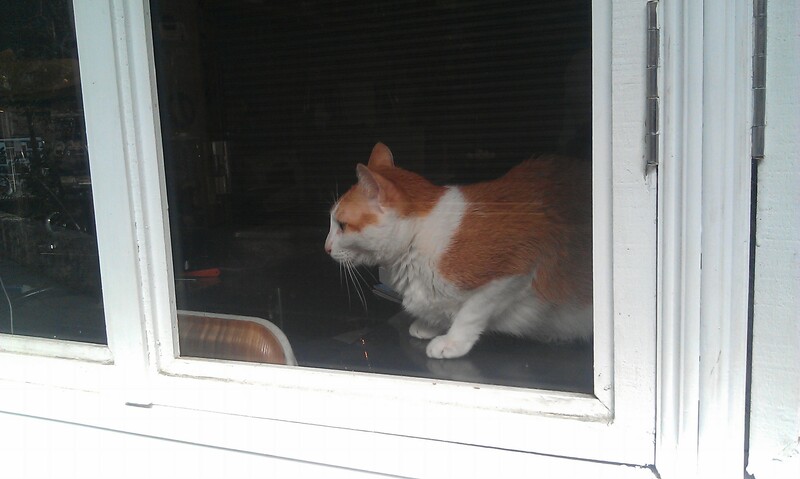 When we left, one of the cats had gone outside to enjoy the sunshine. 我離開的時候, 看到一隻貓去外面. 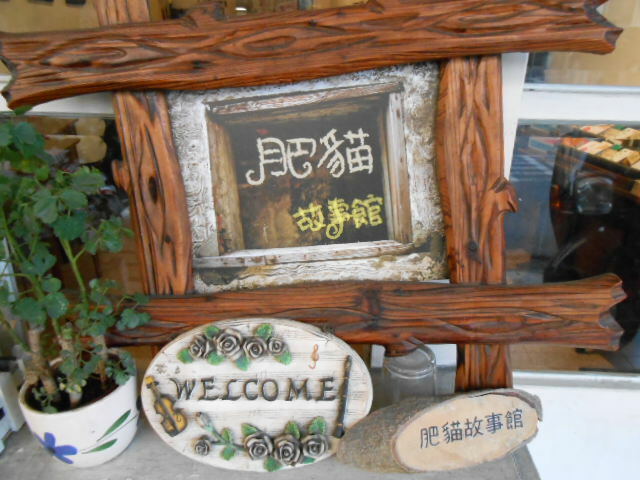 I would recommend this cafe for its atmosphere and great food. 我很推薦這間因為早午餐特別好吃. 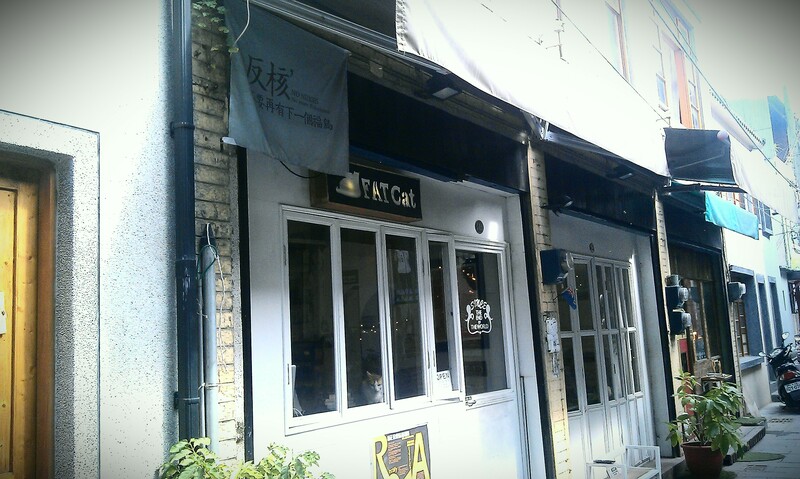 Susan has already written about ‘Fat Cat Story’, but Tainan has another fat cat cafe – Fat Cat Deli! 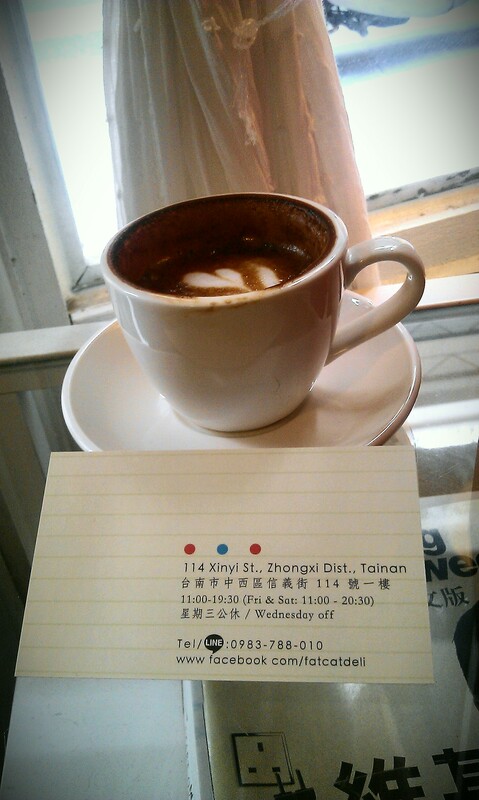 The cafe is located on Xin Yi Street, a quiet street full of old buildings, many of which have been converted into shops and restaurants. 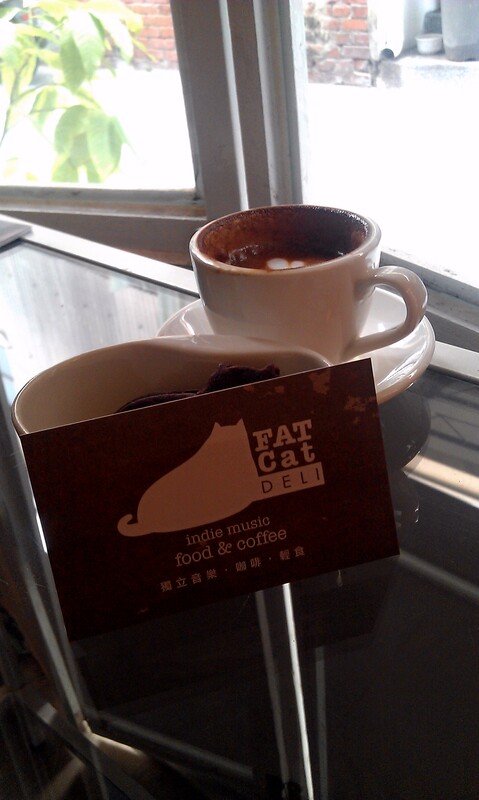 Fat Cat Deli is at the far end of the street near a small temple. As you walk past, you may feel there are eyes upon you. 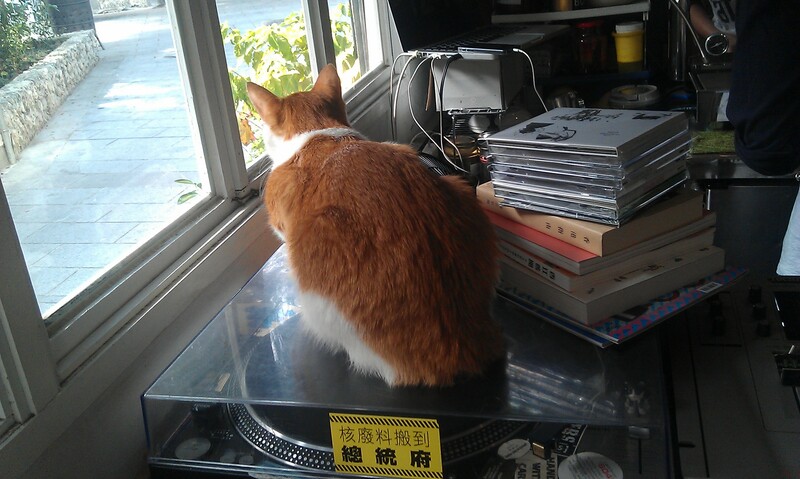 This cat occupies a place of pride on the owner’s record player, and is quite happy to be stroked while you order your coffee. The cafe occupies three main areas: the first is the bar, where you order. 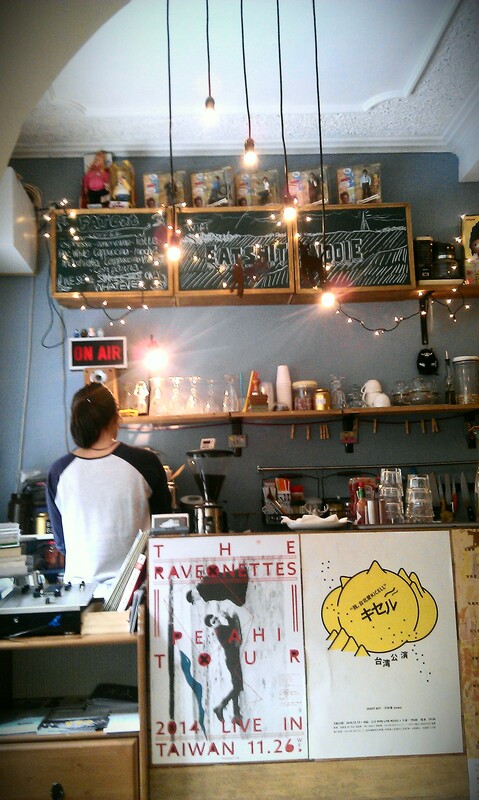 The owners are big music fans and have integrated a lot of their interests in the cafe decor. 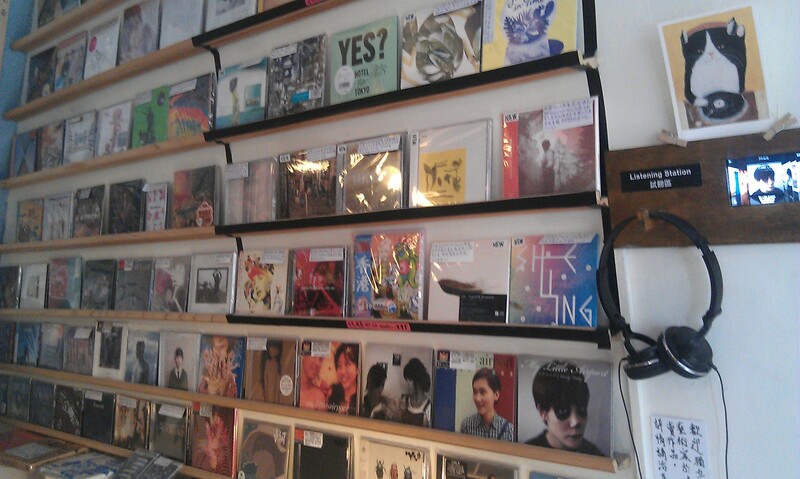 The bar faces a ‘listening wall’ where you can sample a huge range of CDs. An arched doorway leads to the second area, which is the seating area. 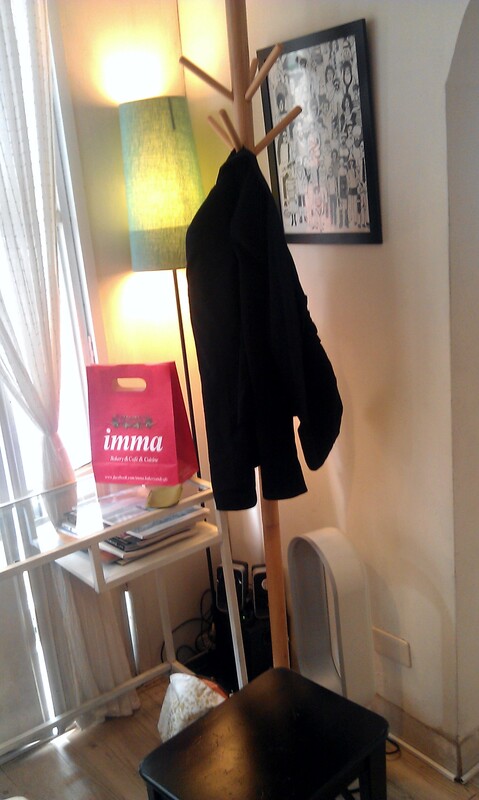 We chose this cozy corner that looks out onto the street. 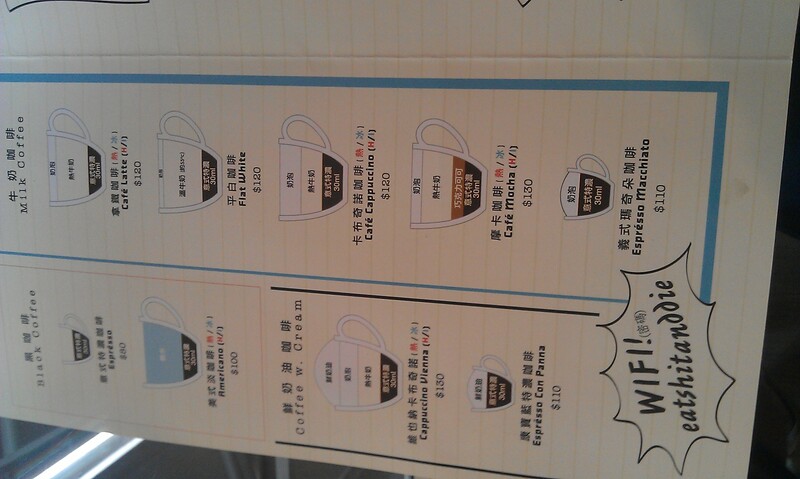 The detailed menu offers many different kinds of coffee, as well as sandwiches, biscuits and cakes. Note the Wifi password! The third area leads off from the bar up an extremely narrow staircase. 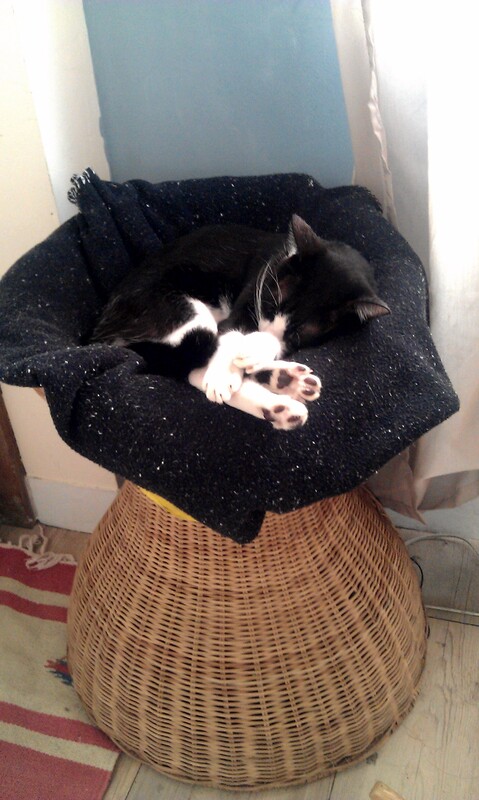 Here, you will find a sunlit room with two more cats. I couldn’t get a good picture of the room, but it has comfortable seating for about 5 people, as well a deck, a back balcony and a large window. 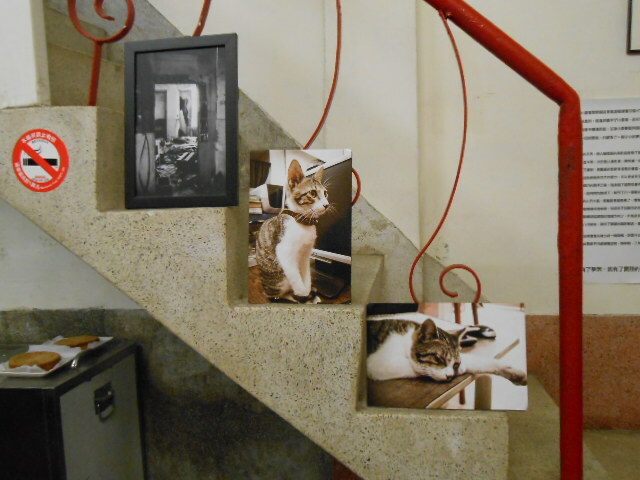 It’s well worth going up to take a look, not only to see the other cats, but also to get an idea of traditional Tainan housing. These two cats were also very friendly and happy to be stroked. 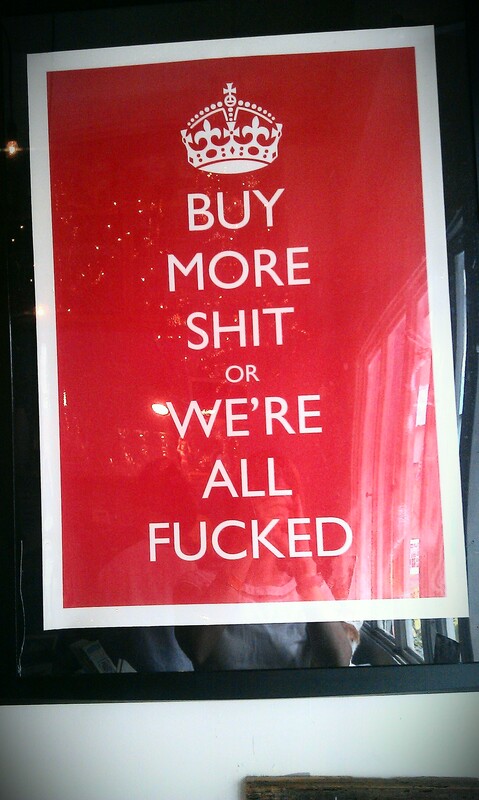 The owners have placed a few signs around the cafe, gently encouraging you to order more drinks if you feel like it. 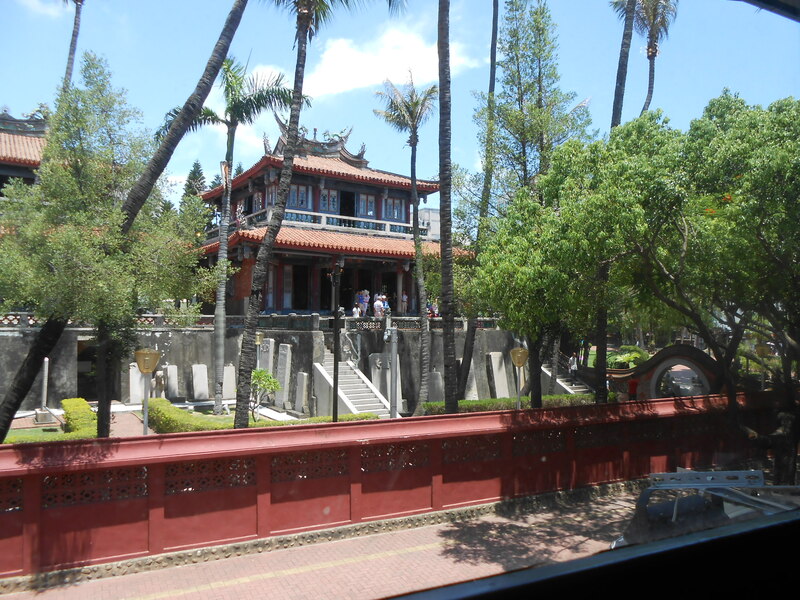 Overall, a great place to spend a relaxing afternoon. 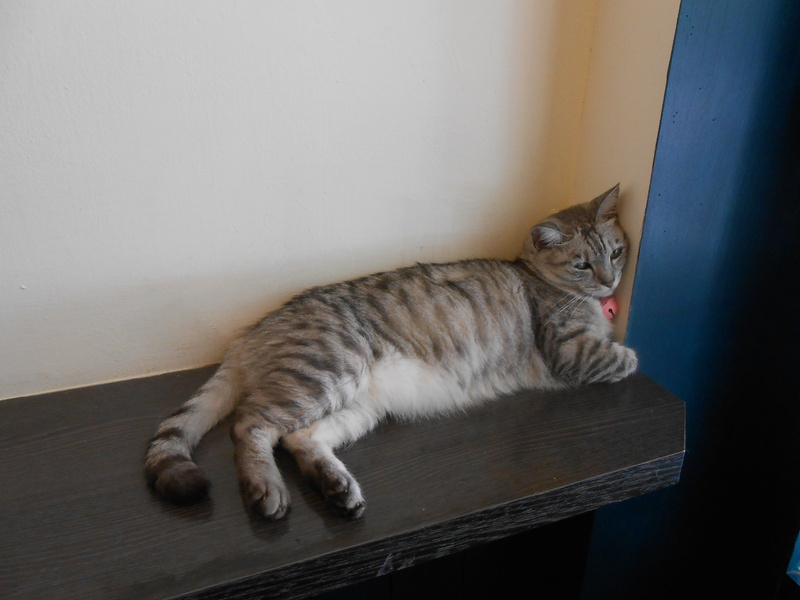 I went to this cat cafe in Tainan before going to the Yanshui Fireworks Festival. 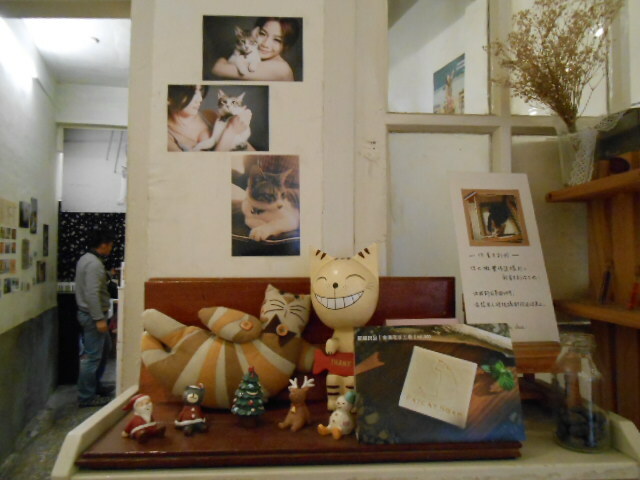 It only has two cats, but it’s very cute and definitely worth going to. 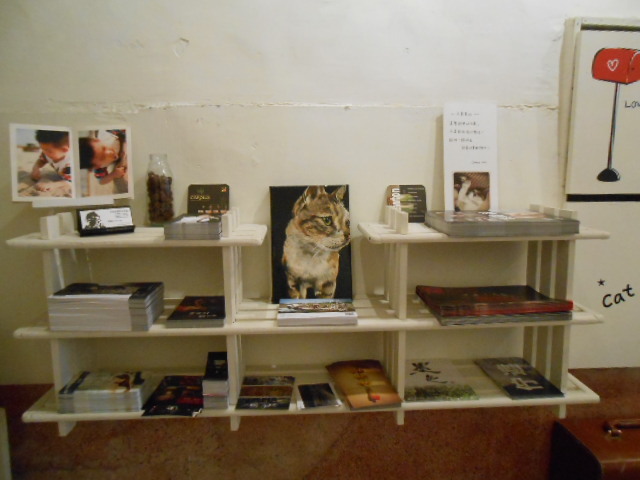 It has photographs taken by the owner and other cat related exhibits by artists and design students. 我去台南去鹽水蜂炮的時候去這咖啡館. 只有兩隻貓, 但是店非常可愛, 不要錯過的地方. 有老闆的攝影, 還有其他設計學生, 藝術家做的關於貓的東西. 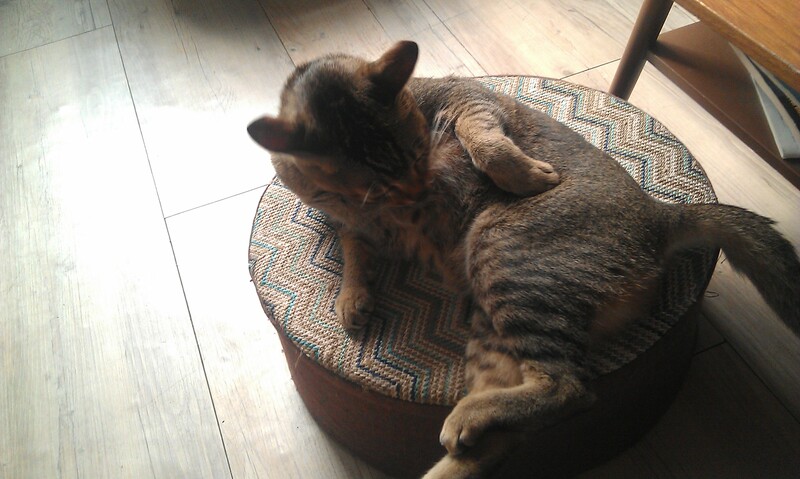 One of the cats is very friendly and sits in customers’ laps. 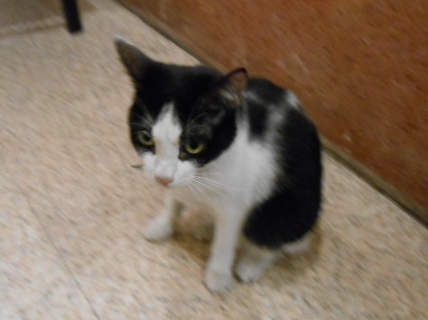 The other one is shy and spends most of its time hiding in the kitchen. The menu was simple, basic coffee drinks and also fresh-baked desserts. I just had an Americano, which was good.